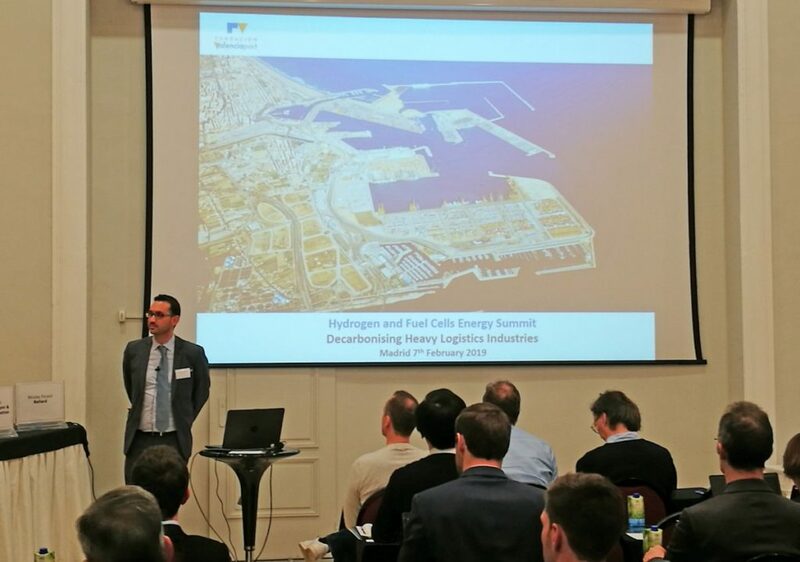 The first internal technical meeting of the European project “H2PORTS – Implementing Fuel Cells and Hydrogen Technologies in Ports” was held in Valencia. H2PORTS, coordinated by the Valenciaport Foundation, in close collaboration with the Port Authority of Valencia, and funded by the Fuel Cell and Hydrogen Joint Undertaking program (FCH JU), seeks to provide efficient solutions to facilitate a rapid evolution from an industry based in fossil fuels towards a sector of low carbon and zero emissions. Hydrogen has been previously tested in other sectors of logistics and transport as a solution for machinery and vehicles, so the action proposes different pilots to bridge the gap between prototypes and pre-commercial products. Thanks to this initiative, the Port of Valencia will be the first in Europe to incorporate hydrogen energy to reduce the environmental impact of its operations. Within the framework of the project, the Port of Valencia will trial three pilots in real conditions: a loading/unloading and container transport reach stacker, powered by hydrogen; a terminal tractor for ro-ro operations, powered by hydrogen fuel cells; and a mobile hydrogen refueling station that will provide the necessary fuel to guarantee the continuous work cycles of the aforementioned equipment and that will work at Grimaldi (Valencia Terminal Europe) and MSC terminals, in the Port of Valencia, during the initial phase of the project. Moreover, H2Ports’s transversal objective is the realization of feasibility studies for the development of a sustainable hydrogen supply chain in the port, coordinating all the actors involved: customers, hydrogen producers, suppliers, etc. The expected results of the project are testing and validating hydrogen technologies on port machinery with the aim of having applicable and real solutions without affecting the performance and safety of port operations while producing zero local emissions. H2Ports will allow to demonstrate these new prototypes in real operations at Grimaldi and MSC terminals, thus becoming the first European port facilities that will use hydrogen-powered machinery. Hydrogen is a clean and renewable energy and will be one of the many topics addressed at AltFuels Iberia 2019, taking place on 11-14 June at IFEMA Trade Fair Center, in Madrid. It will be an event consisting of first level conferences and exhibition of vehicles of all kinds, refueling stations, components, plants, road and marine engines, as well as the entire universe of the alternative fuels industry with the latest technological developments, multiple options for networking, business and new advances. For more information, please contact info@altfuelsiberia.com.